The outside knob turns freely without operating the latchbolt. When a valid code is entered and the blue LED lights burn, the knob will retract the latchbolt. When the door closes the spring latch will automatically lock the door. The key will open the door for management functions. Code Free Mode can be programmed at the keypad using the Master Code. REM2 can be linked to an alarm system which, when activated by a momentary contact, will release the door for 30 minutes. This allows emergency personnel to enter the room to rapidly check that no one has been trapped and overlooked. Hi guys. My name is Darrel and I'm head of the tech team here at LocksOnline.co.uk and thanks for taking some time to tune in and have a look at one of our product reviews. 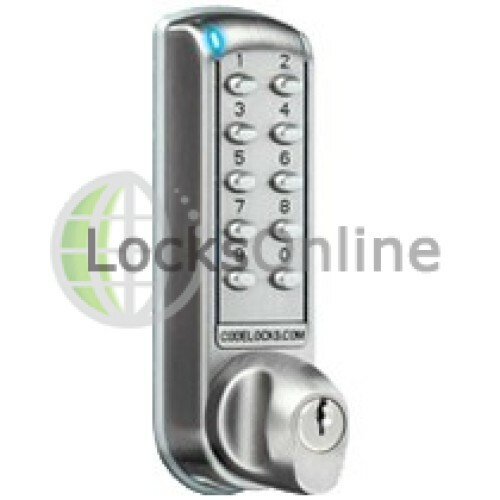 The product that we have here in front of us today is the Code Lock 2000 Range Electronic Combination Lock. Now, mechanical locks are out, electronic locks are in. That's as far as I'm concerned because I love electronics. This is the actual part that you see on the front of the door. Now, there are a lot of features with this particular type of lock and I am going to go through a few of them whilst you see this here. You can have codes up to four, up to six digits long, okay. You can actually store up to 80 user codes if you want to do so. If you punch in the wrong code more than three times it goes into lock down for about 10 seconds. That's pretty standard. On this one here you've got the key override so if it does lock down for 10 seconds then you can put the key in and you can mechanically override it. Or you don't necessarily need to use the code, you can use the keys. Let me tell you some other features that it has. It also has the ability that you can remotely get wired into it, press the release button. That means that if you were thinking of putting this on a reception door or something like that and as a receptionist or there's somebody on an intercom system further away, then you can actually press the button and you can release this lock remotely. So that's another advantage with this particular lock. Again, you won't be able to do that mechanically. Another advantage, as well, is that it has another option of being able to put it into free access mode and that's that you can connect with the fire alarm systems and so forth. 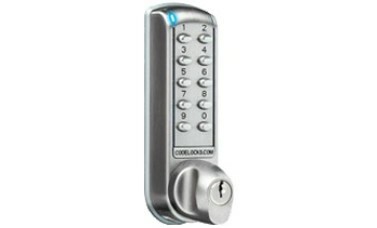 So again, Code Lock are really, really thinking about the operation and the longevity of this particular product and all its functionality. It's trying to cover all the bases to make sure that it's a serviceable product no matter how you plan on using it. And the chances are it's going to do what you want it to do. One of the other advantages, as well, is that you can have a hold open code so you can program in a code that becomes a free code and that free code then makes the door standard access. You just undo the latch and in and out as well. So you may find that after 5:00 you want it to lock down and people try to use codes, but up until then, they can have free access. So that's another advantage to this particular type of lock. So, full of options, there's a full list on our website of all the products, what the product can do, etc. So these are just a few of the major ones that I'm telling to you today. Now, again, Code Lock, really, really singing their praises this year because they really sat down and thought about it in great detail because an indicator LED's here that, again, can be programmed to tell you whether or not the doors it's in are locked or unlocked state as well. Again, all of that is thoughts processing behind the manufacturer of it. And again, if you think that the battery's starting to fail, and it will tell you that it's wanting to change its battery, no problem at all. Here, if you don't have the key, and the batteries have totally failed, you see that there's two little indicators here, and those are where the nine volt PP3 type batteries. You go down to a shop, pick yourself up one of those, you stick the two middles on there, and that will then power it up enough for you to enter your code again and get yourself in. So, again, another top thought going into the process there. Now on the back here you'll see there's the fixings. There's a fixing hole at the bottom and there's a fixing hole at the top and this wire here would go through the door into the battery compartment and the battery compartment situates in the back of the handle in here. And that's accessible by undoing that screw down there and taking the cover off to allow you to change the batteries at any time that you want to do so. So, that's the back, and that's the front. Now, here's the tubular latch, this is the part that actually locks the door and if you notice on here, we've got this little deadlock instead that sits on the back there as you can see and the idea is when you fit this that gets pushed in and it dead locks this latch. The idea then is that you can't use a credit card to try and slip your way through, etc. You know full well that this is going to be in a locked state. The standard back set on this, I'll measure this for you now just to make sure, is a standard 60mm. Now that's pretty standard in the industry when it comes to combination locks so if you were a mechanical one and you want to have the functionality of an electronic one, then the chances are that back set is going to be universal should you wish to want to replace it. So that's fine. It comes with a bag of bits here, standard, there's your fixing screws there to the side. It comes with two keys standard. It comes with a set of batteries, so no problem there. And it comes, then, with all the spindle and so forth into which to interact with the whole set up. Now, one of the other advantages that this particular lock has as well, if you notice here that the fixings is at the top and the bottom. And those work in conjunction with the fixing at the bottom there and the fixing there. And I'll get a measurement on those now for you, very, very quickly. Those fixings there, guys, is 130mm. So from there to there it's 130mm standard. One of the other little top tips, as well, that I want to show you is this spindle here. And it also comes as well with this little piece here as well. And the idea of that there is that it allows you to slide that into there and this will now, that's a standard 7mm follower. So that now will work in conjunction with an existing latch that you may already have in the door. Or a night latch that you may already have in the door. And you can fit that in conjunction, instead of using this, you can use an ordinary latch, etc., that may already fitted into the door. So that again, is another thought process behind Code Lock's methodology in regards to the operation of this. Now, it does come in a different range of locks. 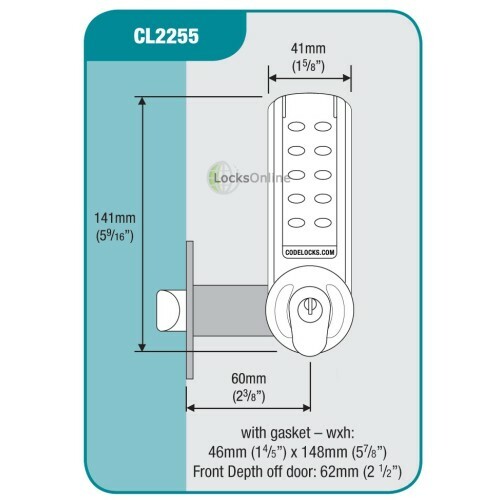 You can also get it with a full deadlock, etc., with a latch as well and you can see all of those particular ranges on our website. There's two gaskets, as well, that come standard with it. So if you're using it externally, it's best to think of using these gaskets, and therefore, then stops the weather from getting in the inside. So, I think I've talked long enough about this product and it gives you a little bit of insight that if you're thinking that this is the product for you, then this is a really good product from a very well respected company in the UK. So, from me guys, I don't think that there's anything more that I can say, but if you need a bit more information, hop on the phone to us or have a chat with us or use our live chat on our website during the working day. It's totally free and you can chat with me or any of the guys who are all knowledgeable on this product should you need to know any more information. And for me, as far as I'm concerned, I'd love to see you as a customer. That'd be really top tip for us. We'd really appreciate that. So, from me, Darrel, and all of us here at the LocksOnline team, thanks for taking the time and catch up with you real soon. Take care now. Bye-bye.